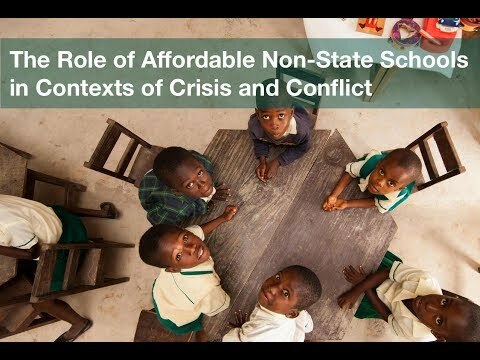 Webcast: What is the Role of Affordable Non-State Schools in Crisis and Conflict Contexts? Between 2000 and 2014, the number of educational institutions affected by conflict increased 17-fold. In 2016, over 109 million children were living in fragile settings. In these settings, a government’s ability to provide education can be severely hampered and affordable non-state schools can respond to the unmet demand for education. Although there is significant research on both non-state education and education in crisis and conflict-affected countries, little has been written about their intersection. On May 22, at 10:00 a.m. (EST), Results for Development (R4D) presented findings from a new report that explores the role of affordable non-state schools in crisis and conflict contexts. Panelists, featuring development practitioners from Results for Development (R4D), Education Development Center (EDC), and USAID, presented findings from El Salvador and Kaduna State, Nigeria, and led a discussion on the role that governments and donors could play to support non-state education providers in crisis and conflict contexts. Affordable non-state schools are defined in this research as formal and non-formal educational institutions that are owned or operated by non-state entities such as private citizens, faith-based organizations, or NGOs, and that target lower-income or marginalized populations. The subject of non-state education is contentious, and more so when considered in crisis and conflict contexts. The purpose of this webcast was not to advocate for non-state providers but to explore potential contributions (negative and positive) that non-state schools can have on education outcomes in crisis and conflict-affected contexts. Read a blog post by the presenters: Can Non-State Schools Provide Educational Services in Times of Crisis and Conflict? Vidya: Thanks for the helpful presentation. Of all the recommendations presented, which one do you think requires the strongest level of political will from the government? Answered in webcast – recording to come soon. Pat Krabacher: In the N-SS teachers are often paid poorly. What types of stipends or allowances are deemed the best to motivate teacher performance and build safety and resiliance in the teacher community? List a few types of stipends/allowances. Ash Hartwell: How can donors avoid the risk that they would be seen to align and support sectarian religious or anti-state agendas? Indeed in many low income countries a systems approach to education is critical, that is there are a variety of components (i.e., teachers and administrations, assessments, finance, etc.) in an education system that needs to be well resourced and functioning for students to be in school and to be learning. As it is indicated in the recent World Bank’s Development Report on Education that “country’s political will” is the most important factor to see improvements in education. In that vein, the Global Partnership for Education, USAID and many other bilateral and multilateral donors, acknowledge this fact and will solely support country developed and driven and education plans. Multilaterals, such as the World Bank have invested considerable resources in developing, collecting, analyzing and disseminating information on what works and doesn’t work in government education systems through their “The Systems Approach for Better Education Results” (SABER) initiative. The issue then is: Is non-state schools and actors taken into account by governments when developing their education sector plans? Does the World Bank’s SABER take into account and provide robust information about the growing number of non-state schools and actors? The answer to these questions is that yes, some countries like Liberia and Uganda are incorporating non-state schools through public-private partnerships (PPPs) in their education sector plans; however, there are many other countries that have not considered the role that these schools can constructively play. Thus, more work can be done in first understanding this sector given that in many cases, it is context specific and secondly, building evidence to see what types of PPPs work or do not work to achieve equitable access to quality education. Pat Krabacher: It is estimated that Nigeria has 30 million kids out of school, additionally, given the dichotomy between North and South Nigeria is extreme. Q: How the Nigerian gov't ''will'' will ever be able to address the marginalized student population in the North, given the investments that must be made into basic teacher training and school buidlings which have been destroyed? In the meantime, at leat one generaton has missed out on basic education. Thank you for the question, Pat. We agree that there are significant differences in education outcomes between the Northern and Southern zones in Nigeria. One way the Nigerian government can address the large “out-of-school” population is to view informal non-state schools as gateways to reaching these students. Studies show that four out of five out of school children in Northern Nigeria receive some kind of religious education and often from schools that aren’t recognized by the government (See Antoninis’ report, pg 2). Engaging with non-state schools, potentially through public-private partnerships to support teacher training, could alleviate the financial burden placed on governments to build schools from scratch. Although not perfect, some of these ideas could prevent a generation from missing out on a basic education. Jake Thomsen: Thanks for the presentation, all! QUESTION: The ANSS appear to be concentrated in urban areas. Are they also a solution to rural access issues in conflict-affected areas? Is thee a will or capacity of ANSS to expand services beyond cities? What are the policy implications of this geography? Typically, non-state schools that have worked in the rural contexts are community-based schools that are run by non-government organizations (NGOs) (e.g., CBE schools in Afghanistan operated by Save the Children and BRAC) or religious institutions (e.g., Fe y Alegria, Tsangaya and Islamiyyah schools in Northern Nigeria and community schools in Zambia). An organization that has successfully expanded in a large part of a country’s hard-to-reach areas is BRAC in Bangladesh. Another organization that has reached many rural schools in Latin America is Educatodos. A major policy implication is that governments’ can help expand the reach of these schools by providing financial resources. This is what happened with both BRAC and Educatodos where governments provided financial resources to expand the schools and model in other parts of of the country or to other countries. Rene Raya: You may be aware that there are volumes of studies that have contrary findings and do not support the recommendations as stated. I hope these can also be considered. There are also several findings contatined in concluding observations based on HR reviews undertaken by HR treaty bodies - among the findings are low fee/affordable non state school may actually promote segregation and widen inequity in society. Perhaps more caution should be exercised to ensure that support or promoting non-state school do not infringe on the right to education, discriminates against certain disadvantaged groups or exacerbate inequity even further. The research team certainly acknowledges the potential for affordable non-state schools to worsen social exclusion and exacerbate inequality. These risks are vital to consider when contemplating supporting ANSS. Donors and governments should take extra effort to consider the local context and determine whether individuals or groups may have their right to education infringed upon by an expansion in the non-state sector. This study’s conceptual framework could be a useful tool for initiating this process. Nevertheless, it is important to recognize the significant role of the non-state sector in providing education in challenging contexts, first because of the large number of children who depend on ANSS for education, and second because of the sectors potential for greater flexibility and local responsiveness. Many actions that governments could take to support ANSS do not require a transfer of funds from public sources to private schools, but could instead, for example, take the form of removing overly constraining regulatory policies that prevent schools from responding to rapid changes in the education ecosystem. Suezan Lee is a senior education finance specialist at USAID’s Economic Growth, Education, and Environment Bureau, in the Office of Education. She provides strategic education finance guidance, specifically with regard to public-private partnerships, work with non-state actors, public financial management, and innovative financing mechanisms. She has also served as the deputy basic education team leader and chairperson of the USAID 2009–2011 Education Strategy Committee. Lee holds a doctorate in international education from Boston University and an MBA with a concentration in finance from American University. Nina Papadopoulos has worked for over 15 years promoting the right of education in conflict and crisis with a diverse range of organizations. She currently supports USAID missions to ensure the effective implementation of USAID’s Education Strategy, particularly the agency goal of increased equitable access to education in crisis and conflict environments. Nina is the co-author of the Education Cluster Coordinator Handbook. She wrote a background paper for the 2011 EFA Global Monitoring Report titled, “Achievements and Challenges of the Education Cluster in the Occupied Palestinian Territory, Somalia, and Sri Lanka.” For the past three years, she has been an adjunct at Georgetown University, in the Program on Justice and Peace Studies. Nina is a doctoral candidate at the Center for International Education at the University of Massachusetts. Robert Francis is a senior program associate on the education team at Results for Development (R4D). He studies non-state schools in Latin America and sub-Saharan Africa with an eye to accumulating and analyzing data that can provide guidance for investments in future initiatives for children who lack access to quality schools. Francis previously worked for AidData, where he conducted a field study to determine factors that motivate transparent behavior in Indian NGOs. Francis holds a BA in political science from Brigham Young University. Nicholas Burnett is a senior fellow at Results for Development (R4D), a Special Professor of International Education at Nottingham University, chair of the Board of UNESCO’s International Institute for Educational Planning, and a member of the NORRAG Consultative Committee. Burnett’s work focuses on pragmatic and innovative approaches to important but neglected topics in education, including out-of-school children, adult illiteracy, and financing for early childhood development programs. He has a BA in economics from Oxford University and an MA and a PhD from the Johns Hopkins University School of Advanced International Studies. Arjun Upadhyay is an education specialist at Results for Development (R4D) with over seven years of experience working on education sector analysis and reform in Africa and Asia. As a program officer, he led projects on international education finance, early childhood development costing and expenditure analysis, and research on low-fee private schools. Upadhyay has a master’s degree in international development from Georgetown University’s School of Foreign Service and a BA in international relations and economics from the College of Wooster.